It's no secret that I "keep" stuff. I keep stuff that I think I can make other stuff out of. I save pine cones. I have a lot of pine cones. 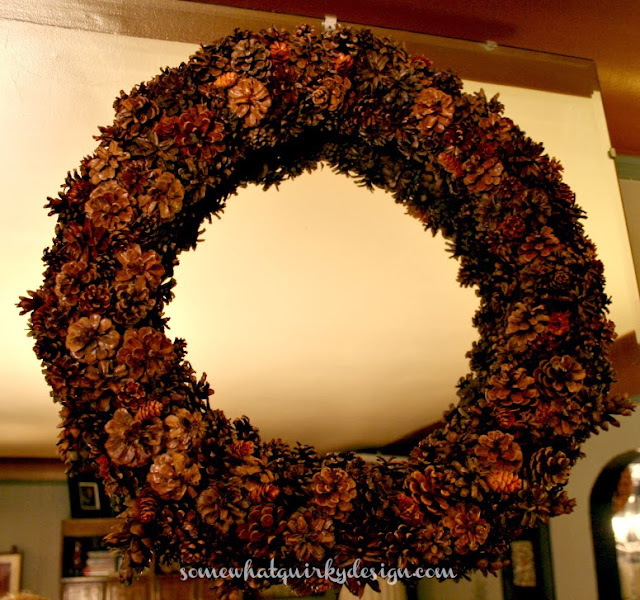 I've made my share of stuff from pine cones but I had never made a wreath before. I've wanted a pine cone wreath for a long time. 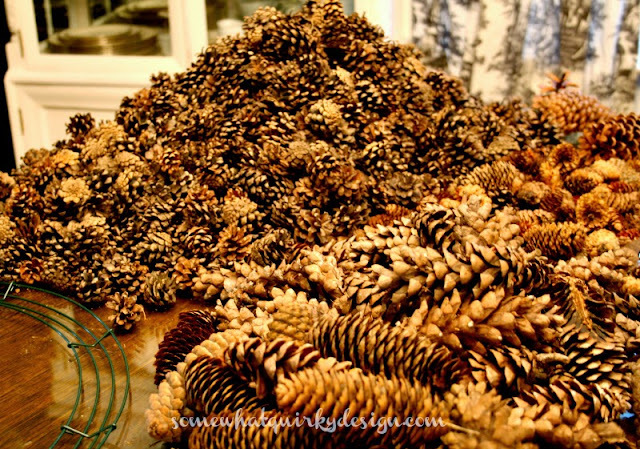 I never made one because I didn't have the right kind and size of pine cones. I had to wait until I had the right kind and sizes of pine cones. You see it takes several kinds of pine cones to make a wreath the right way. I call it the "right way" because I learned how from Martha. Martha Stewart. And if Martha said it, I guess that is the ''right way''. I remember seeing a demonstration on TV. This is my best replica of what I think I remember. It was a long. time. ago. Just so you'll know - I had lots and lots of the little bitty, little and sorta little pine cones left over. 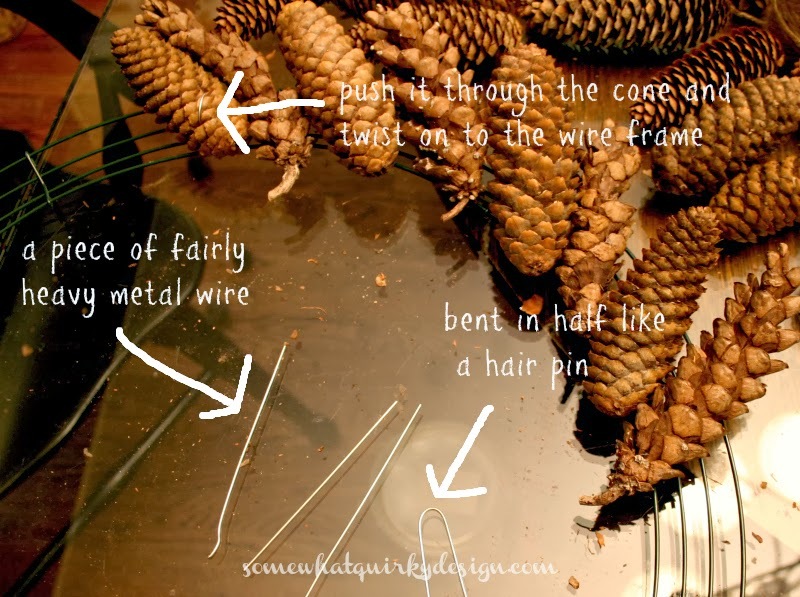 take your long skinny tight pine cones and attach them side-by-side to the wire frame. Do this by bending the floral wire into a u-shape, wrapping it around the long skinny tight pine cone and connecting the wires behind the wreath. Now this isn't how the demonstration went. They must have had a different style of wire form because they were able to stick the long skinny tight pine cones through the frame from inside to out. There was no way that was going to happen with this particular wreath form. No. Way. So I went and found my package of floral wire. When you're done the wreath will look something like this. This is the base for your wreath. Note: I wish that I had not used so much angle in the placement of these pine cones. If I had placed them more perpendicular to the frame the wreath would have been wider. The final wreath ended up a little skinnier than I would have preferred. Next glue clusters of the largest of the pine cones you have - my largest ones were three inches across or less. Glue these clusters in like intervals around the entire wreath. 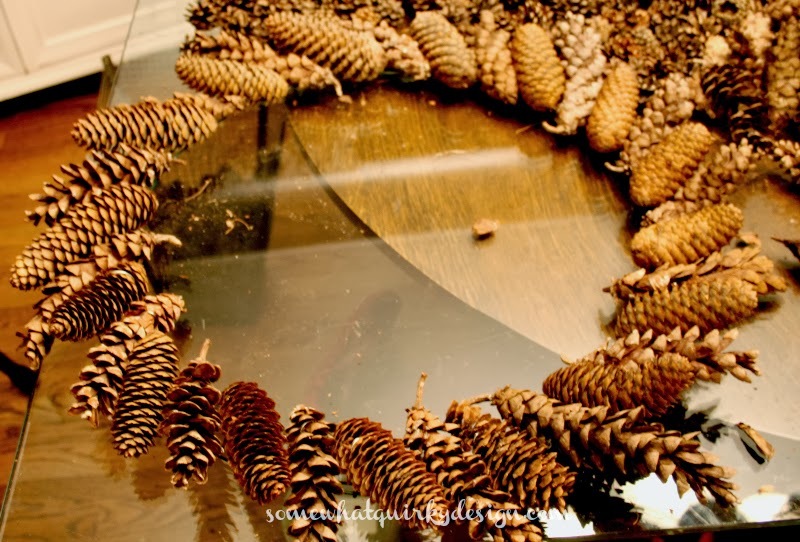 Finish by gluing the smallest size pine cone into any gaps or places where you want to build up the wreath. Decide where you want the top of the wreath and attach more floral wire to the wreath form to make a hanger for the wreath. 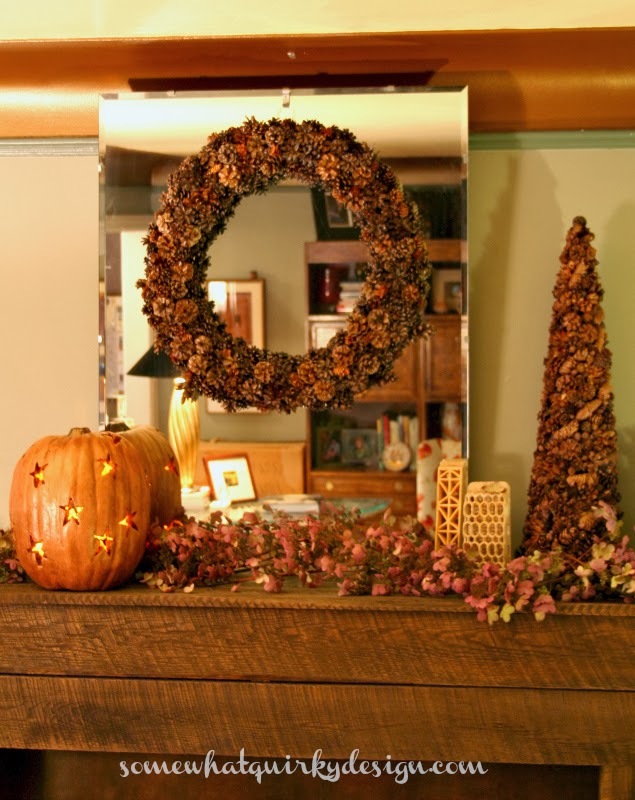 If desired spray the wreath with your choice of finishing product. I used Minwax Poly-Acrylic because it is what I had on hand. Once I can spray outside I will probably use some Deft Clear Wood Finish. Once it is dry you're done. Done. I know pine cone wreaths had their hey-day way back when. But I don't care. I finally have one. And I'll probably have many, many more pine cone projects before I've used up my still rather large pile of pine cones. This might be a good time to mention that I tried the whole pine cone bleaching thing. BIG. FAIL. A lot of time and a whole bottle of bleach and very little bleaching going on. It's easier just to paint the dang things. Update: I finally got some decent pictures of the wreath - check them out here! 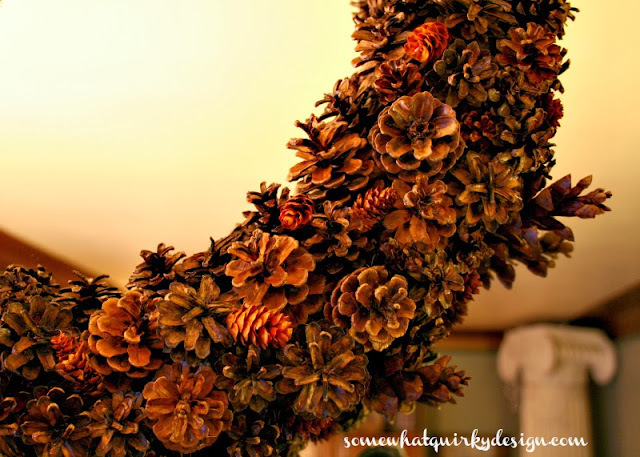 Who cares if pine cone wreaths have had their hey day? You made a beautiful wreath. I wish I had access to pine cones. P.S: Re bleaching pine cones, from what I read try using full strength bleach plus leave them to sit at least twenty-four hours in the solution also don't be mislead by looking at them as often they have to dry and open before the change in colour is appreciated which can take several days. To speed the drying process up I understand they can be popped in the oven as well.